From the financial fraudsters of Enron, to the embezzlers at Tyco, to the insider traders at McKinsey, to the Ponzi schemer Bernie Madoff, the failings of corporate titans are regular fixtures in the news. But what drives wealthy and powerful people to white-collar crime? 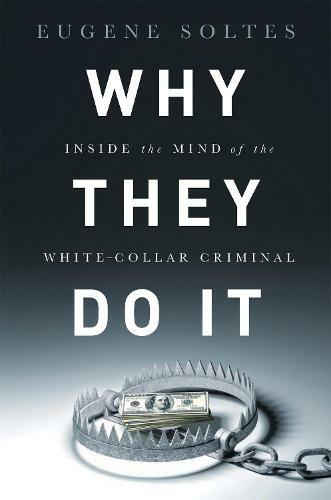 Harvard Business School professor Eugene Soltes draws from extensive personal interaction and correspondence with nearly fifty former executives as well as the latest research in psychology, criminology, and economics to investigate how once-celebrated executives become white-collar criminals. The product of seven years in the company of the men behind the largest corporate crimes in history, Why They Do It is a breakthrough look at the dark side of the business world.Soltes reveals how the usual explanations fail to tell the whole story of why many seemingly successful people go over the line. White-collar criminals are not merely driven by excessive greed or hubris, nor do they usually carefully calculate costs and benefits before breaking the law. Instead, Soltes shows that most of the executives who committed crimes made decisions the way we all do- on the basis of their intuitions and gut feelings. The trouble is that these gut feelings are often poorly suited for the modern business world where leaders are increasingly distanced from the consequences of their decisions and the individuals they impact.The extraordinary costs of corporate misconduct are clear to its victims. Yet, never before have we been able to peer so deeply into the minds of the many prominent perpetrators of white-collar crime. With the increasing globalization of business threatening us with even more devastating corporate misconduct, the lessons Soltes draws in Why They Do It are needed more urgently than ever.